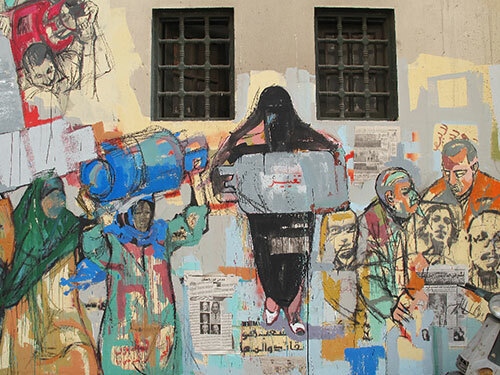 Hanaa El Degham’s graffiti of women queuing for cooking-gas canisters instead of standing in the voting line on the day of the post revolution parliamentary elections. Image: Mia Gröndahl (© 2013). This article is based on a collection of insights published in “Gender in Mediation: An Exercise Handbook for Trainers”, produced by the Center for Security Studies at ETH Zurich in November 2015. How can conflicts be resolved without one side imposing their view of what is right and good on the other side? This is at the heart of mediation as a method to deal with conflict, and also at the heart of a transformative understanding of gender equality. Both approaches question paternalistic and patriarchic ways of resolving conflict, where a leader decides what is right for others without listening to their views. Rather than seeing gender equality as a question of political correctness and normative necessity, we should explore it as a fundamental shift in how we shape societies and deal with conflict: questioning patriarchy and fostering cooperative decision-making processes. The problem of patriarchy has been described by Roman Catholic Abbot Mark Patrick Hederman with the following words: “Men have always dominated and masculinity has at all times and in all places usurped the feminine. Certainly, the patriarchal society of the last two-to-four-thousand years, with its excess of male power and energy, has been responsible for many of the world’s present problems: ruthless pursuit of power, destruc­tive exploitation of the natural world, nuclear weapons, violence between nations, denigration of women, child abuse, racial oppression, unbridled competiveness and untrammeled materialism.” These stark words serve as a useful wake-up call, so that we start looking at gender questions for what they really are: a fundamental shift in the values and approaches in how we deal with conflict. As the philosopher Zygmunt Bauman sees it, there are two strands of feminism. The first strand seeks the same opportunities for women and men: if men are allowed to kill, why should women not also be allowed to kill? If men are politicians and generals, why should women not also be politicians and generals? This strand in feminism is important, but it is not enough. It tends to use advocacy approaches to gain access to power positions, but not to question the values behind them. The second strand goes beyond equal opportunities and access to power, to fundamentally question the values that govern our society and the way we deal with conflict. Aligned with the transformative feminist school and mediation, this strand questions the very values of paternalistic leadership – be this leader a man or a woman. In this way, the transformative approach to gender equality responds to the problem of patriarchy that Mark Hederman has outlined. It is closely aligned with mediation that seeks to help parties find an agreement, but does not impose this from the outside. There are numerous implications of this second strand of gender equality and feminism for mediation in the context of violent political conflict. Gender affects the actors, the content, the context and the process of mediation. Mediator and conflict parties are actors that need to become aware of how their cultural heritage is shaping their needs, perceptions and ways of interaction. Carol Gilligan shows how in the USA, for example, relationship-building skills are associated with the feminine, while the drive for independence is associated with the masculine. However, to become effective mediators, one needs to be good in relationship building, as well as independent and autonomous in how one works. Mediators also need to analyze how gender questions affect the content that comes up in peace negotiations. For instance, women often have a different analysis of the conflict, but is it being taken as seriously as their male counterparts? Will a power- and wealth-sharing agreement influence the economic roles of women and men? As the combatants are demobilized from the security forces, are the needs of women and men dealt with appropriately? Such questions are touched upon in Dekha Ibrahim Abdi’s documentary film “The Wajir Story”, which highlights the vital role of conflict analysis in mediation, and how women are key actors in this endeavor because they have different perspectives and access to information compared to men. From there, mediators also need to be conscious that a conflict generally changes the context and gender roles of a society. While the men are out fighting, the women have taken on new roles in economic and political life. After the conflict is resolved, women will often refuse to go back to the former gender roles – a phenomenon which Europe experienced after the Second World War. Mediators need to consider this in terms of how the agreement is shaped and how it is implemented. Being blind to such societal context changes means solving one conflict only to have sowed the seeds for new ones. Finally, all aspects of a mediation process may be shaped by gender: goal formulation, participation, venue, logistics, timing, agenda setting etc. The important thing is not to stick to rigid formulas when seeking to design a process in a gender sensitive manner, but rather to explore what can be done in any given situation. Rather than pushing for gender quotas, for example, a process only with men may still be gender sensitive, if questions of patriarchic decision making are questioned. Furthermore, a process only with women may not be gender sensitive if, for example, religious women do not come because they cannot take their chaperons with them. Questioning patriarchal approaches to decision-making and opting instead to use a mediation approach that gives space to all actors involved does not mean trying to solve all problems in a totally cooperative and fully inclusive manner. This would be naïve and unrealistic. From a practical perspective, leadership in mediation processes is important, given the amount of stakeholders involved. But in the world we live in, and in the way we make decisions, there is certainly a lot more space for cooperative decision-making than is being used at the moment. And if leaders are needed to make decisions for others, they need to be representative and have their constituencies concerns in mind. Leaders need to listen as much as they need to talk. Leaders need to be servants as much as bosses. The problem of patriarchy cannot be dealt with only by having women in the positions of men: we also need to question the fundamental values of top-down decision making; integrate feminine and masculine approaches to dealing with conflict; and increase the space for cooperative, consensus oriented decision-making. The latest publication in the “CSS Mediation Resources” series focuses on mediation and gender equality and offers some innovative ideas on how to teach this subject. “Gender in Mediation: An Exercise Handbook for Trainers” collects 47 practical exercises helping negotiation and mediation instructors make their courses more gender-sensitive. Rather than focusing on theory or normative arguments, it aims to help people experience what it means to deal with patriarchy in a different manner.